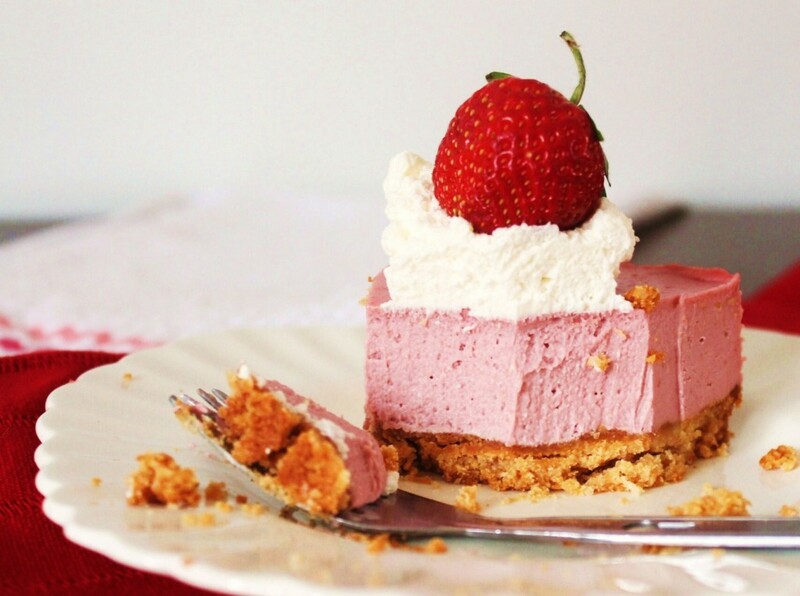 A gluten free, dairy free, grain free cheesecake. My best friend (who is not gluten or dairy free) described it as a “yummy frozen strawberry yogurt”. When you serve it from a frozen state is more like icecream, and when served chilled, it becomes more like a fluffy mousse! Either way, it’s fabulous and sweet, creamy goodness. Combine all ingredients in a high powered blender (I use a Vitamix) or food processor. Blend until light and fluffy. Pour into baked crust. Freeze at least 2-4 hrs, until set. Serve frozen or chilled (depending on desired consistency, I suggest trying it both ways) Add a dollop of coconut whipped cream and fresh strawberries. For a summer variation – I used the zest of the lemon as well, and it made a nice, bright flavored “Strawberry-Lemonade” cheesecake. As you can see in the photos, I used a spring form pan, but a standard 9 inch pie plate will work just fine! Also I can not guarantee it will look exactly the same, as different food processors and blenders will vary the end results. But either way, flavors will still be the same! *photo taken after cheesecake was thawed, you can see the fluffy mousse-like texture. IF, you have any leftovers, simply cut into slices and keep in the freezer. 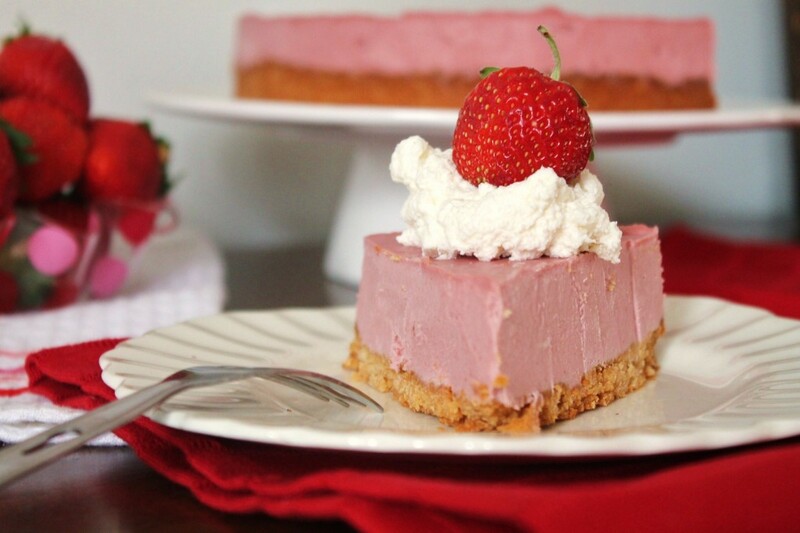 Then when you are in need of a quick dessert, just pull out one of your cheesecake slices! If stored properly this dessert can last in the freezer a few months! This dessert will also make a lovely and festive treat for your Valentine. Do you go out on Valentine’s Day? We opt to stay in, away from the crowds. My husband cooks for me, and we usually wait until the kids are down (early bedtime of 7), and we enjoy a nice quiet evening in. HI ! Eager to try this . . .
One question could you mean coconut milk instead of coconut oil ? Thank you so for sharing! Yummy! That looks amazing. I can’t wait to try it. What did you make for the whipped cream-looking topping on top? The topping is my coconut whipped cream, click on the link and it will take you to the recipe, it is on the bottom of the post! Thank you! Looks great! Sorry I missed the link the first time around. I made a sweetener-free version of the “cheesecake” and crust last night, and I’m looking forward to trying it out on Valentine’s Day. It’s in the freezer now…. Gotta try this. Thanks! Look yummy! Is it possible that I didn’t soak the cashews long enough……you could see the specks of cashews. It didn’t look creamy like yours! Just made it and the filling is amazing! Will also sub the strawberries for other fruits for variety. Thanks for these wonderful dessert recipes! Keep ‘em coming! Yummy!! I made this last night and it was divine!! Thank you for sharing!!! I didn’t have strawberries so I used blueberries. I also didn’t have enough honey so subbed a little agave. It turned out REALLY good. The crust is very graham cracker like. I added a heart of chocolate chips to the top to make it a little more Valentine’s Day festive :) My soon to be 7 year old now want mini strawberry, chocolate, and plain cheesecakes at her bday. Btw. That is awesome to see that you are controlling your Chron’s with healthy eating. I have Chron’s Colitis and am trying to do the same. My family of five and I started a Paleo way of eating at the beginning of this year. It has helped me, but I am going to do a more strict version for myself for a month or so because I’m still having issues. Made the strawberry and the kids say that is their favorite! You can whip egg whites until they’re light and foamy and use that instead of coconut oil. This gluten-free, dairy-free strawberry ice cream is a favorite, full of fresh, summery flavor. Pure indulgence made with wholesome ingredients. Substitute a gluten-free flour mixture for traditional wheat flour in almost any cake recipe to make a suitable replacement. You can also seek out gluten-free and dairy-free recipes, such as those for flour-free chocolate cake. If dairy-free individuals also can’t eat eggs, use an egg replacement product or ground flax seed mixed with water to set the cake properly. When you’re preparing a flour-free chocolate cake or any chocolate dessert, read the ingredients on the chocolate package carefully to make sure that the variety of chocolate you use is completely dairy-free and gluten-free. This looks amazing! Just wondering, do you think I could substitute a different nut for the cashews? My husband is allergic to cashews and pistachios :( If so, what nut would you recommend and would the ratio be the same? Thanks in advance! Wow! Just made this “cheesecake” and it was perfectly divine. Thank you so much for sharing your work. This is my 7th year on SCD and my second on Paleo and it is recipes like yours that inspire me to stay with it.